WHY CHOOSE CHIPPERS TREE SERVICE? Our professional tree services in the Dallas Ft. Worth Metroplex are second to none. We truly believe our company is best suited for anyone’s tree service needs. Here we give a short list of 10 reasons of why to choose us. this. Safety is very important in our company. We invest time in safety training with our men and in the right insurance. Till today (knock on wood) we have yet to use our insurance for a damage we have occurred or injured worker. 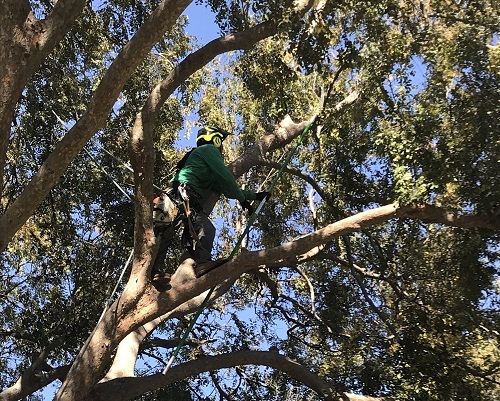 We believe we should be compensated once the promised service has been fully completed and the customer is completely satisfied with the professional tree services we offer. Therefore, we do not take payment upfront unless we are told otherwise. Trees are huge assets to both residential and commercial properties. An inexperienced tree worker or someone that has no idea of the art of pruning will cause more damage to the tree rather than any benefit. Taking too much live tissue off the tree or taking big branches off when they should be avoided may stress the tree. Most of these damages are permanent. Our crews of men know how much should be taken off on certain trees without causing the tree to stress and to meet the client’s expectation. We started as small landscaping company in the early 90’s and made the switch over to full tree services in mid of 2000 after the demand for our professional tree services went up. We have been exposed repeatedly to the same tree services over and over so we have a very thoroughly understanding of the art of pruning, removing and stump grinding. We are experts at what we do. Our professional tree services are offered to the Dallas Ft. Worth Metroplex for residential and commercial properties. Performing tree pruning or removals produce a lot of unwanted debris. We own the proper equipment to make sure your property is left cleaner than before we get to your property. We plans in being in business for as long as possible. A way to achieve this goal is having a great service at a great price. Therefore, we give our customers great prices to build our client base, and not cheat a customer because we know they will never return. All our customers love our work. We have several references of our current customers that are more than happy to recommend us to anyone and allow us to use them as references. We understand there are hard times for some customers. That why offer the flexibility of accepting credit cards such as Visa, MasterCard, Discover, American Express and also checks and cash. Our tree services have become an art we are proud of. Our employees are proud of the services we offer and in return your home is treated like our own.